Falls are a serious risk to people working in all kinds of industries and in all sorts of environments. The Bureau of Labor Statistics shows that the majority of worker deaths from falls to a lower level while on the job cause a majority of falling fatalities each year. Known as “falls on the same level” these falling injuries are reported by the United States Bureau of Labor Statistics as causing over 15% of all nonfatal work injuries. Three percent (3%) of these falls on the same level (slip and falls, trip and falls) result in the death of the worker. In 2011, “falls to lower level” were the cause of 553 fatal work injuries. Statistics with known height of fall reveal that the fall causing death in these cases was less than or equal to 20 feet. 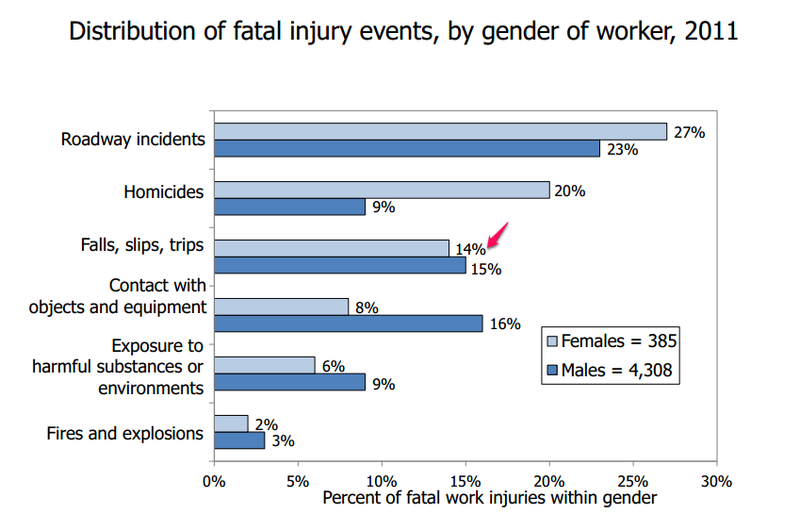 There is no significant distinction between the number of men and the number of women who suffer falling injuries at work on the job. According to the Occupational Safety & Health Administration, falling is especially risky for workers in construction jobs. OSHA considers falls to be the highest cause of worker deaths in the construction industry. According to its statistics, falling is the leading cause of death for construction workers, followed by electrocution, struck by object, and caught-in/between as the “Fatal Four” which together were the causes of over half (56%) of all construction worker deaths in 2011. 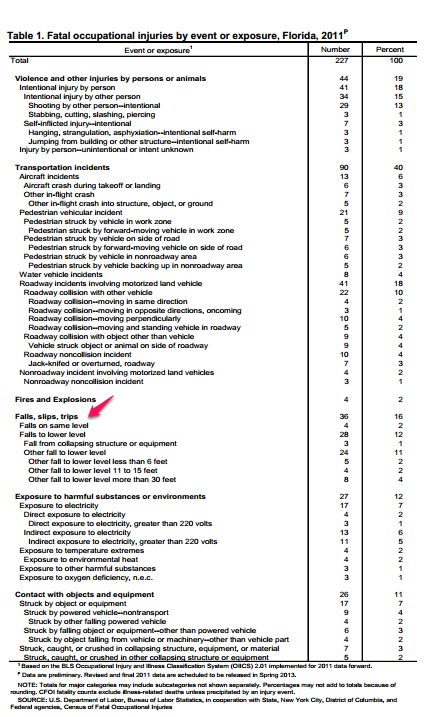 According to BLS data, in Florida during 2011, construction workers died on the job more than workers in any other industry (41) and 15 of these worker deaths were due to falls, slips, and trips. 36 Florida worker deaths from falls, slips, and trips.